2.1 For the Empire! For the Legion! Conquer the Stormcloak capital and bring Ulfric to justice! Fight through waves of Stormcloaks. Reach the Palace of the Kings. Force Ulfric Stormcloak to surrender. For the Empire! For the Legion! "All right. It's time to deliver the final blow to the Stormcloak rebellion. You have all fought bravely, and sacrificed much to bring us to this point. Ulfric thinks he can hide behind the walls of his castle. But we will fight our way in and drag him out through the rubble to face justice. Because this is the end for them, the Stormcloaks will fight like cornered rats. They will be fierce and crafty. But they are no match for Legionnaires. You are the best and the brightest warriors in Tamriel. Professional soldiers, fearless and devastating. The Emperor will be paying close attention to what happens here today. Men who distinguish themselves will be well rewarded. Ready now! Everyone, with me! For the Empire! For the Legion!" When he finishes his speech, he and his soldiers will charge into the city. Follow them through the main gates. Once inside, you will be met by wave after wave of infinitely respawning Stormcloak Soldiers. Your task now will be to fight your way through the opposition to reach the Palace of the Kings. Debris will block the direct route to the palace, forcing you to find another way. After entering the city, take an immediate left and head west to the market square. Upon reaching the square, turn right past the blacksmith's forge and travel north to the cemetery. Once there, take a left down the steps, then take the steps north past the Hall of the Dead. Upon reaching the top of the steps and smashing the barricade, head east down the alley. Once you reach the end of the alley, turn left and head north up the steps, destroy the barricade, and proceed to the Palace of the Kings, where Ulfric and his second in command, Galmar Stone-Fist, are waiting for you. When you enter the palace, Ulfric will be sitting on his throne with Galmar standing by his side. General Tullius and Legate Rikke will enter, and Tullius will demand Ulfric's surrender, stating that Ulfric is the only one standing between Skyrim and peace and that he needs to be killed to regain the peace. After they're done talking, Ulfric and Galmar will become hostile and attack the three of you. Kill Galmar and force Ulfric to his knees (Ulfric is still essential at this point). If you are having trouble with this battle, you can allow Tullius and Rikke to do most of the fighting, as they are both essential. General Tullius will then prepare to kill Ulfric, but Ulfric will request that his death be at your hands. You will then be given the choice of executing Ulfric or making Tullius do it himself. If you choose to kill Ulfric, Tullius will hand you a leveled enchanted sword for the task, though you don't need to use the sword to kill Ulfric. If you choose to let the general kill Ulfric he will still give you the sword afterwards. After Ulfric is dead, Tullius and Rikke will head outside. Follow them out and watch as Tullius gives a speech to the assembled Imperial soldiers, thanking them for their service. After the completion of this quest, the Imperials will install a new Jarl, Brunwulf Free-Winter. If you later approach him, he will grant you the privilege of buying property in Windhelm and, if you speak to him, the opportunity to become Thane of Eastmarch. During and after the siege of Windhelm, three catapults are present in nearby Windhelm Military Camp. They can be activated to fire projectiles into Windhelm, though this has no effect on the siege. If you complete this quest before finishing the main quest, you can encounter both Ulfric's and Galmar's spirits in Sovngarde, lost in Alduin's soul-ensnaring mist. Ulfric expresses dismay at how all his war did was feed Alduin, while Galmar is incensed that even in Sovngarde the Dragonborn still dogs his steps. After the defeat of Alduin, Galmar will state that an eternity is too long to hold a grudge and praise you for defeating Alduin. Completing this quest will harm the relationship you have with outspoken stormcloak supporters in the various cities, giving you quite a number of hostile greetings. NPC functionality like trading or quest stages will not be affected though. After killing Ulfric and Galmar, their corpses will not disappear and will remain in the palace permanently, even after Brunwulf has been made Jarl. 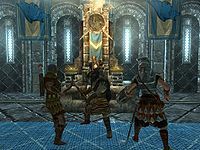 After finishing the battle outside and entering the Jarl's palace, General Tullius will speak to Ulfric and initiate combat, but Ulfric and Galmar may ignore Legate Rikke and Tullius and attack only you, while the Legate and General simply draw their swords and watch. Both NPCs can then be forced into the recovery state but will not die, as they are still marked as essential. This may be caused by advancing through the Civil War questline far enough that the Season Unending quest can't be started, resulting in Ulfric and Galmar mistakenly maintaining their essential status. Reload from before starting the battle and instead play through the rest of the main questline, or reload an earlier save that will allow you to complete the Season Unending quest. Alternatively, type <setstage MQ302 350> in console before entering the palace to mark Season Unending as completed. In some cases when you meet General Tullius outside of Windhelm, the city gates will be open slightly. If you activate the gates they will close and then lock. After this happens there will be no way to access Windhelm. Reloading a previous save may only work if you go back before the start of the quest. This can be solved by opening the console, selecting the gate and using the "unlock" command. Sometimes after you hear General Tullius give his initial speech and charge into the Windhelm, the battle will not load. Instead you will enter the normal city with no Legion Soldiers or Stormcloaks. General Tullius and Legate Rikke will both be there and will attack the Windhelm guards on sight. If you have this bug, going back to a save before the start of the liberate Eastmarch quest will not help. What triggers this bug is currently unknown, but some unknown previous interaction with the city seems the probable culprit. You can use console commands to complete the quest, but Ulfric will continue to rule Windhelm and the house there will be inaccessible. 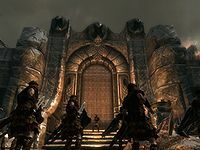 A workaround to complete the quest with full imperial occupation of Eastmarch is to continue with General Tullius and Legate Rikke into the Palace, confront and defeat Ulfric, and then leave the city for thirty days until it resets. This is possibly because General Tullius will follow his showdown scripting once you get him into the palace. When you enter the palace you need to move quickly away from the door or you will become stuck in cinematic mode. A solution to this issue is to quit without saving, and let the game pick up the auto save from inside the Palace of Kings. This may take two or three attempts. The other thing you need to be careful about is the presence of two Windhelm guards at the door and Yrsarald Thrice-Pierced. The guards will attack General Tullius and Legate Rikke (who will not respond) and Yrsarald Thrice-Pierced will join the final battle, but since he is an essential character, you won't be able to kill him. Afterward, General Tullius will not give his speech and Yrsarald Thrice-Pierced will follow you around attacking until you leave the city. After the thirty days there should be no difference in result from a normal victory. After finishing the quest, Hadvar will constantly follow you with his sword drawn. This bug happens when he comes a few days after the battle to thank you. To fix this, simply stand as close to him as possible, save your game, then close and relaunch Skyrim. After finishing The Battle for Fort Amol and returning to the Imperial camp, Legate Rikke tells you to get orders from General Tulius, but the quest marker remains on Rikke. Open console and enter: setstage CWSiegeObj 1. This will start the siege quest. After finishing the quest, Brunwulf Free-Winter sometimes won't appear in the Palace of the Kings. All Stormcloak versions of the jarls and their housecarls will be there, sitting at the table, but without Brunwulf in the palace, you are unable to purchase Hjerim. Use the Unrelenting Force shout on everyone at the dinner table. This will give you a bounty in all the locations where the jarls were from. Fast travel away from Windhelm, then back. It is possible for the General to never give you his sword, forcing you to do the execution without it. After the battle ends, the game may continue looping the battle music, regardless of combat status. Completely exiting the game and reloading will fix this. This can be fixed by opening the console and entering removemusic MUScombatcivilwar. If you talk to Rikke or Tullius after completing the quest, they'll tell you that they expect you to clear out any Stormcloak camps you come across. All occupants of these camps will continue to attack you after giving warnings to leave, but the Stormcloak commanders in each camp will still be marked as essential, so they will not be killable. Subsequently, camps cannot be cleared. This issue has been addressed by version 1.2.3 of the Unofficial Skyrim Patch; the commanders will no longer be essential at this point. Using the console, you can manually retrieve the base IDs of the commanders and set them to non-essential. 1 I am to join General Tullius in the final attack on Windhelm, putting an end to the Stormcloak rebellion, once and for all. This page was last modified on 22 March 2019, at 05:25.